We want you to understand the charges on your natural gas bill. The more you know about natural gas rates, the easier it will be to make informed decisions about your energy usage or whether a natural gas contract with an energy retailer is right for you. The Ontario Energy Board sets natural gas rates for Enbridge Gas Distribution Inc., Union Gas Limited and EPCOR Natural Gas Limited Partnership. We do not set natural gas rates for Kitchener Utilities or Utilities Kingston. Use our bill calculator to compare the cost your utility charges you with the costs outlined in an energy contract. 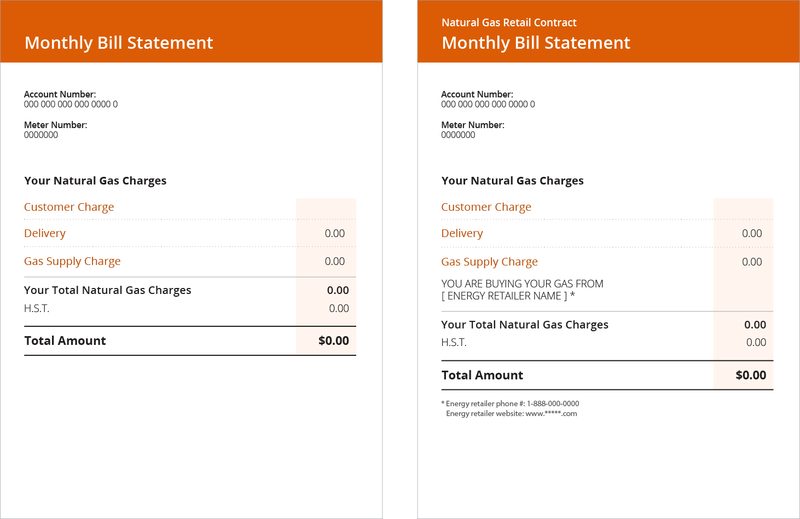 Below are two sample natural gas bills. One is for a customer that buys their natural gas from their utility. The other is for a customer that buys their natural gas from an energy retailer (also known as natural gas marketer). What different charges are called on your bill depends on who your natural gas utility is. If you buy natural gas from Enbridge, Union or EPCOR, your natural gas rates are set by the Ontario Energy Board as explained below. The Ontario Energy Board does not regulate the prices that energy retailers charge in their contracts. In this case, the price you pay for the natural gas that you use is set out in the energy contract. This is a fixed charge to administer your natural gas account. It includes meter reading, customer services, equipment maintenance and emergency response services. You have to pay this charge even if you don’t use any natural gas during the billing period. The Ontario Energy Board approves the Customer Charge annually. Transportation: The cost to transport natural gas from Western Canada and the United States to Ontario. The National Energy Board approves the Transportation tolls and charge. Delivery: The cost to deliver natural gas to customers in Ontario through the utility's distribution system. This charge includes all operating and capital costs and a regulated rate of return. The Ontario Energy Board sets this charge. Storage: The cost to store natural gas. Transportation, storage and delivery charges vary depending on the amount of natural gas you use. How they are shown on your bill depends on who your utility is. For example, Union Gas customers see Storage as a line item on their bills, but for Enbridge Gas customers, storage is included as part of the delivery item on their bills. The Ontario Energy Board approves each utility’s delivery charges. The delivery charges for Enbridge and Union are adjusted once a year using a five-year incentive regulation framework that was approved by the Ontario Energy Board for the years 2014 through 2018. These annual adjustments are done using a pre-set formula that is based on inflation. This covers the cost of the natural gas that you use. It is charged based on the amount you use. The utilities pass through the cost of natural gas that they buy for their customers on the open market, without a mark-up. Future costs – the utility estimates how much gas they expect their customers to use and the market price for natural gas over the next 12-month period. Past costs – the utility also reviews the difference between what was forecast to be paid the last time and what was actually paid. Because the forecasting is done far in advance, it is never exact. We adjust rates periodically throughout the year so there’s less likelihood of customers or the utility owing a large amount at a given time. Find the current rates and learn how they are set. If you buy your natural gas under contract with an energy retailer, the price you pay for the natural gas that you use is set out in the energy contract. It is not regulated by the Ontario Energy Board. It’s important that you do your homework to see if an energy contract is right for you. Find out more about energy contracts. Utilities not only deliver natural gas to your home or business, they also issue your bill. Use our bill calculator to estimate your monthly bill. You can also compare your current bill with a contract offer from an energy retailer.